Each winter, MYAC jazz students have the extraordinary opportunity to learn from and perform for a notable guest artist during our weekend-long “Jazz in January” event, and this year was no exception as we warmly welcomed acclaimed trombonist, composer, arranger, and educator Francisco Torres for a masterclass and performances with students. Francisco hails originally from Hermosillo, Sonora in Mexico, and now makes his home on the West Coast. His varied and extensive resume includes soundtrack credits on major animated films such as “Coco” and “The Incredibles”, as well as a host of TV and commercial work. He performs live as musical director for the legendary Poncho Sanchez, is a member of Gordon Goodwin’s Big Phat Band, John Beasley’s Monkestra, and the Clare Fischer Big Band. He’s a Yamaha recording artist with credits on albums with top artists such as Bob Dylan, Ricky Martin, Dr. Dre, Michael Buble, Frank Ocean, Pitbull, All American Rejects, Spoon, Angelique Kidjo, Ry Cooder, Brian Setzer, and Los Lobos, among others. Though you might not know by reading his impressive bio, Francisco began his musical studies at age 15, an age that’s sometimes considered late. However, he quickly made a name for himself in various musical genres from classical to jazz to rock and pop. During the masterclass he led at MYAC, students listened closely as he recounted his journey from a teen, who just happened upon a jazz band rehearsal one day, to today. He emphasized his belief that modern musicians must be open to a diverse career path, as the music industry continues to change and develop. Despite an unexpected snowstorm that dropped roughly 8 inches of snow on the Fort Sheridan area, the fireplaces were ablaze at the MYAC Center on January 19th and 20th as Francisco led the MYAC jazz students in individual workshops, offering his valuable guidance and instruction. 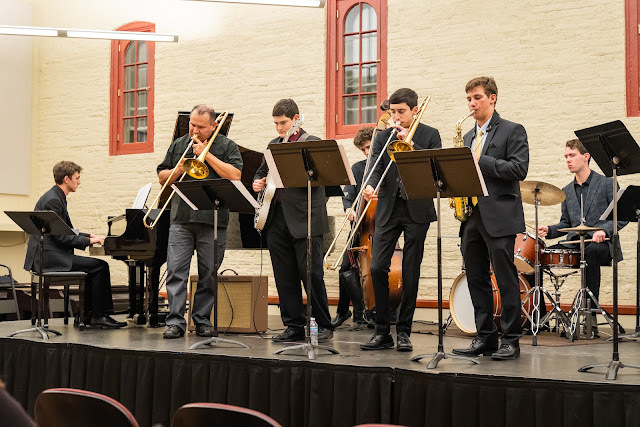 To conclude the masterclass, younger Jazz Ensemble and older Big Band and Jazz Orchestra students gathered with Francisco and MYAC Jazz Director, Neil Carson, in an exciting jam session that emphasized improvisational skills, theory, harmony, rhythm, and performance tips. The multi-age nature of the group allowed the older students to provide informal mentoring to the less experienced students. The following afternoon on Sunday, Francisco and MYAC’s Big Band and Jazz Orchestra finished the weekend with a concert in the MYAC North Hall to the delight of a full audience of parents, friends, and community members. This wonderful Jazz in January weekend could only be possible with the generous assistance of our community of supporters. Through this, MYAC can offer these unique opportunities to young people interested in exploring this rich American art form, in a setting where they learn from both one another and working professionals with expert instruction and unmatched performances they might not receive in a standard music program.